A.T.I.L.R.A. is the workers association of the dairy industry in Argentina. 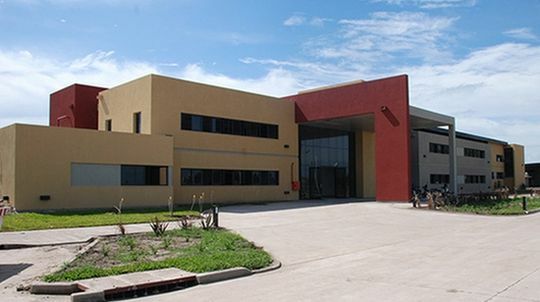 In Sunchales in the province Santa Fe, Argentina they built a high tech training centre with a total area of 64.000 m². There are three modern buildings on this campus: an auditorium with 3D projectors, conferencing and interpretation technology, a building with a total of 24 lecture halls which are also equipped with the latest technology (PC workplaces, video and teleconferencing technology) and a hotel with 14 rooms. The engineers who were responsible for the implementation of the new technology worked out a concept and catalogue of requirements. As this is an ultramodern centre, the conferencing technology had to be up-to-date as well. They demanded a high level of functionality, quality and attractive design. The microphone units with Revoluto technology of the wired MCS-Digital conference system from beyerdynamic were predestined. Due to the patented Revoluto technology they provide a real large speaking zone with a high sound quality no matter if the speaking person is leaning backward or turning his/her head to right or left side while speaking, the volume and audio quality stay the same. As A.T.I.L.R.A. organise their meetings in this auditorium where guests from all over the world take part, an interpretation system for six languages was also required in addition to the conference system. Due to the MCS-D 202 interpreter station, MCS-Digital can meet this requirement without an additional system. 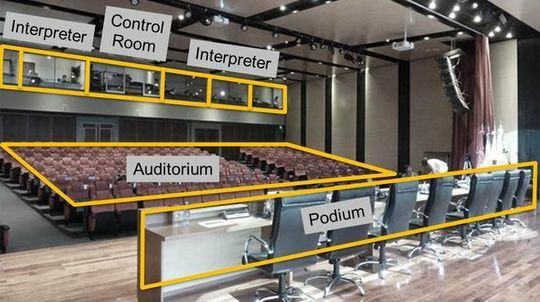 The interpreter stations (two units per language) are in the upper back of the auditorium in two separate booths. The MCS-D 3171 microphone units have a channel selector switch to select the interpreter channels. The participants of the meeting can select the required language and listen to it via the DT 2 headphone. In addition to this by using the function buttons of the MCS-Digital microphone unit, votings can be performed quickly and easily. The steno-s 4 Court conference software is used to record meetings. The software is ideal to complement the beyerdynamic conference system. By using this software, both the interpreter channels and conference channel can be recorded separately. Furthermore, markers can be placed in the recording for a targeted access when writing the minutes of the meeting later.